Budding is a type of asexual reproduction. It is most commonly associated with bacteria and yeast, but some animal species reproduce via budding, too. A parent organism creates a bud from its own cells, which then form the basis of the offspring organism and develop into an organism resembling the parent. Animals that reproduce this way are basic organisms, either without reproductive organs or with both male and female reproductive organisms located internally. The vast majority of flatworms reproduce by budding. These animals, biologically, are extremely basic. They have no respiratory or circulatory systems and therefore no need for body cavities. They take in oxygen and nutrients through the process of diffusion. To reproduce, flatworms produce self-fertilized eggs and release them. Upon release, these eggs split and go on to grow into entirely new organisms. All types of parasitic flatworm, such as tapeworms, use budding. Budding is an important adaptation for parasitic animals, as this method of reproduction means offspring are guaranteed to be born into the ideal habitat, namely the host organism. Jellyfish don’t rely solely on budding to reproduce. They first release a sperm and egg into the water. Once fertilized, the sperm and egg grow into a basic organism called a polyp, which lives attached to the base of a rock. The polyp then grows, before releasing a genetically identical bud of itself, that grows into an adult jellyfish. Sea anemones reproduce in a similar fashion to jellyfish. The first stage of reproduction, whereby the polyp is produced, is sexual; the second stage of reproduction, whereby the polyp buds, is asexual. The polyp then goes on to form a “medusa" that reproduces with itself to form a polyp. Due to the nature of budding, large colonies of organisms can be produced at a very fast rate with minimal interference from outside factors. One of the best examples of this phenomenon is the coral reef, which is a huge colony of living organisms, almost identical to one another, created via reproductive budding. 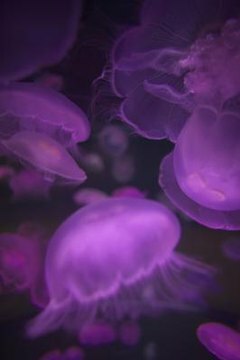 Scientific American: How Do Jellyfish Reproduce? What Is the Lifespan for Moon Jellyfish? What Are the Physical Characteristics of a Coral Polyp?